Angelika Markul If the hours were already counted, 2016. Installation video with music by Simon Ripoll-Hurier. Film, black and white, sound, 11’47’’ loop. Naica crystal framed and a crystal-shaped installation. If the hours were already counted is a single-channel, site-specific video installation by Angelika Markul featuring a 2016 film shot in Naica, Mexico—a crystal cave in the Chihuahua desert. The crystal cave is now closed and no longer accessible to humans. Projected in a site-specific installation, Markul translates and transposes the environment of the cave into Sector 2337’s gallery space to raise questions about scientific technology and aesthetic exploitation. Here, scientists try to move among giant crystals suspected to have formed more than 200,000 years ago. The figures struggle with high temperatures and the 99% humidity while looking for primitive life forms. In this ancient labyrinth, we don’t know if there is a way to get in or get out. Thanks to C/ PRODUCCIONES & PROYECTO NAICA. Angelika Markul was born in 1977 in Poland. She lives and works in France and Poland. In 2016, she received the COAL Prize awarded to an artist whose practice navigates between art and environment. 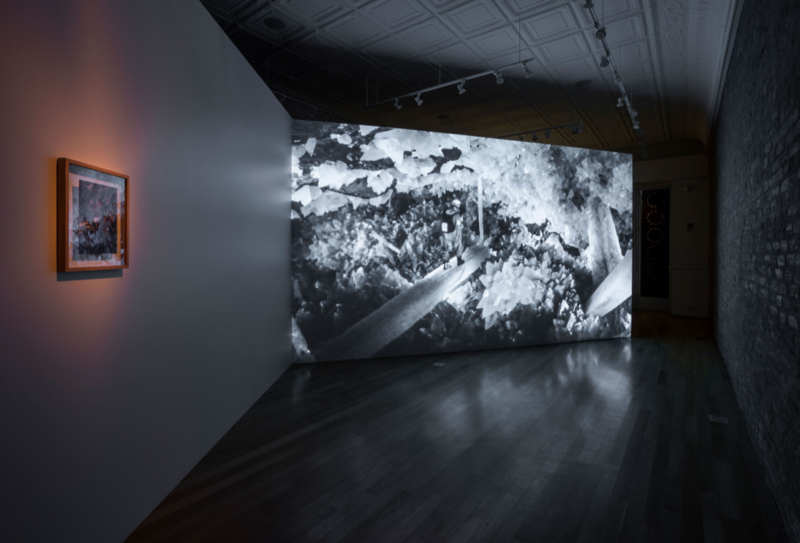 Recent solo exhibitions include: Centre international d’art et de paysage de l’île de Vassivière, Vassivière, France, 2019; Musée de la Chasse et de la Nature, Paris, France, 2018; Naturaleza reimaginada, Muntref – Centro de Arte Contemporáneo, Buenos Aires, Argentina, 2018; Tierra del Fuego, Leto Gallery, Warsaw, Poland, 2018; Excavations of the Future, Laurence Bernard gallery, Geneva, Switzerland, 2016; What is lost is at the beginning, CSW Zamek Ujazdowski, Warsaw, Poland, 2016; Terre de depart, Palais de Tokyo, Paris, France, 2014; The Unleashed Forces. Angelika Markul and Contemporary Demonism, Muzeum Sztuki Łódź, Łódź, Poland, 2013; Installation monumentale, Domaine de Chamarande, Chamarande, France, 2013; Galerie Foksal, Warsaw, Poland, 2012 ; Salon Noir, MAC/VAL, Musée d’art contemporain du Val-de-Marne, Vitry sur Seine, France, 2010; Now New Moon, CSW Zakii, Torun, Poland, 2009.